We can recondition Brake and Clutch hydraulic cylinders across the Vanden Plas vehicle range. Brake hoses and hydraulic cylinder kits are usually avaiable from stock. 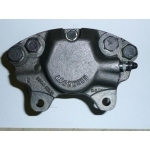 Remote Brake Servo with Stainless Steel sleeved hydraulic Servo Slave Cylinder fully rebuilt and ..
Front Brake Caliper- Austin Vandan Plas- 4000cc R - 1964-68- RH PLEASE REMOVE ALL BRAKE P..